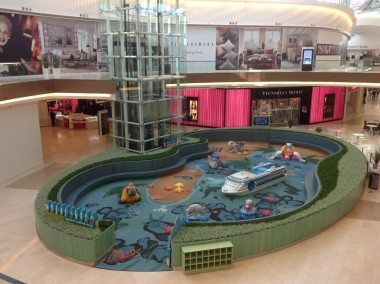 The Mall of San Juan | Tate Ornamental, Inc.
Tate Ornamental gladly welcomes the difficult, ambitious, and extraordinary with optimism and as inspiration. The Mall of San Juan, in Puerto Rico, presented several unique challenges and opportunities to expand our skill-set and experience. Items such as a helical, elliptical, solid surface and wood customer service desk, a continual radius wood veneer bulkhead, and a serpentined, meandering 3Form & upholstered play court, were all unprecedented for Tate and proved to be exceptional works of art. In addition, we were able to equip the Project Facilities, Security Areas, and Restroom Areas with custom plastic laminate casework and quartz counter tops. Throughout the concourse you will find our glass guardrails over the bulkhead and fountain, metal tree grates, and stainless steel base and cladding. The Mall of San Juan, although not our first, was definitely our largest overseas project to date and enabled us to showcase our capabilities of combining Metal, Millwork, and Stone well.